Scotland has over 700 islands which are categorized into four main groups: Shetland, Orkney, Inner Hebrides and Outer Hebrides. These four main island groups are best suited for touring. The best way to experience Scotland’s islands is taking an island hopping trip. Each of the main groups of islands have different characteristics and features that make them special. The Inner Hebrides have a wide variety of whiskies to sample while the Outer Hebrides have crystal clear waters off the Barra Coast. 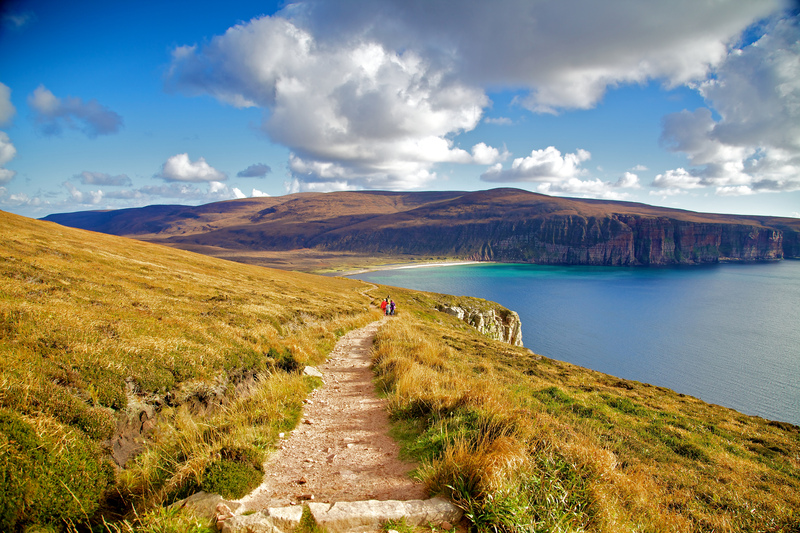 Orkney and Shetland are great for island hopping because of their vast history and remnants of ancient civilization. They also have incredible seabirds on cliffs at nature reserves. Isle of Islay: The Isle of Islay is known as the “Queen of the Hebrides”. It is the home to eight working distilleries where you can sample the fine whiskies. The peat whisky is cut from the moss lands and give the malts a distinct flavor. If whisky isn’t your thing, Islay is also a great place to experience bird life, seafood and dramatic coastal seascapes. Colonsay: Colonsay is the ideal destination for anyone seeking a relaxing time, getting away from the hustle and bustle of daily life. The island has a array of plant and birdlife, wild goats and rabbits and one of the finest quasi-tropical gardens in Scotland. On the island is the Colonsay House which is famous for it’s remarkable collection of floral species and unusual trees and shrubs. Isle of Barra: Visit the Isle of Barra where you can visit Kisimul Castle. It is the only significant surviving medieval castle in the Outer Hebrides. it is known as the “Castle in the Sea” due to its location on a rock in the bay. The Castle can only be accessed by taking a five minute boat trip from Castle Bay. The Castle is a three-story tower house and has stunning views of Castle Bay and the surrounding area. Isle of Lewis: Isle of Lewis is home to the Calanais Standing Stones which has a visitor center containing an exhibition, cafe and gift shop. These 5,000 year old Callanish Stones are famous all over the world. Be sure to check out the Story of the Stones exhibition in the Visitor Center! Lerwick: Lerwick is located on mainland is acts as the main port for boats traveling to and from the Shetland Islands. It is home to the Shetland Museum which is set on the waterfront. The museum tells the story of Shetland’s heritage and culture. The museum has galleries containing everything from Shetland lace to Pictish art and the first telephone introduce in the Islands. This museum is a great location to check out before traveling to one of the 15 inhabited islands making up the Shetlands. St Ninian's Isle: St Ninian’s Isle is a large natural sand causeway with sea on either side. It is on the west coast of Shetland, and links the South Mainland with the Isle. The beach is picturesque and is often showed in photographs of Shetland. The beach is in a rural farming region with archaeological sites located on St. Ninians Isle. S tenness: Stenness is a village on the Orkney Mainland and is home to the Ring of Brodgar. It is one of the finest stone circles in the world and dates back from 2,500 to 2,000 B.C. The stone ring originally contained 60 megaliths however, only 27 of these stones remain today. The reason for the creation of the Ring of Brodgar is unknown but it may be an astronomical observatory or a religious shrine. The Ring of Brodgar is one of the sites that make up the Heart of Neolithic Orkney which was award UNESCO World Heritage status. Hoy: The Old Man of Hoy is a must-see destination while on the Isle of Hoy. It is a famous 450 foot sea stack and is perhaps Orkney’s most famous landmark. It is probably less than 250 years old. It is popular among climbers and has been used as a BASE jump and for highland walking. You can walk from Rackwick to the Old Man of Hoy to see the beautiful site close up. The Old Man can also be seen from the daily Scrabster-Stormness ferry route.